AnaJet (A RICOH Company) provides a complete ecosystem of products designed to offer profitable DTG solutions for every budget and skill level. Ricoh DTG printers empower users to print crisp, high-resolution images in vibrant, eye-popping color. Delight your customers and earn repeat business by creating customized t-shirts, hoodies, shoes, tote bags, and more. The possibilities are endless. Create graphics using your favorite design software and then use AnaJet’s rip software to position and fine-tune the image for your garment’s specific style and color. Cure the ink into the fabric with a heat press, tunnel dryer, or curing oven to create a long-lasting, vibrant garment that is soft to the touch. That’s it! 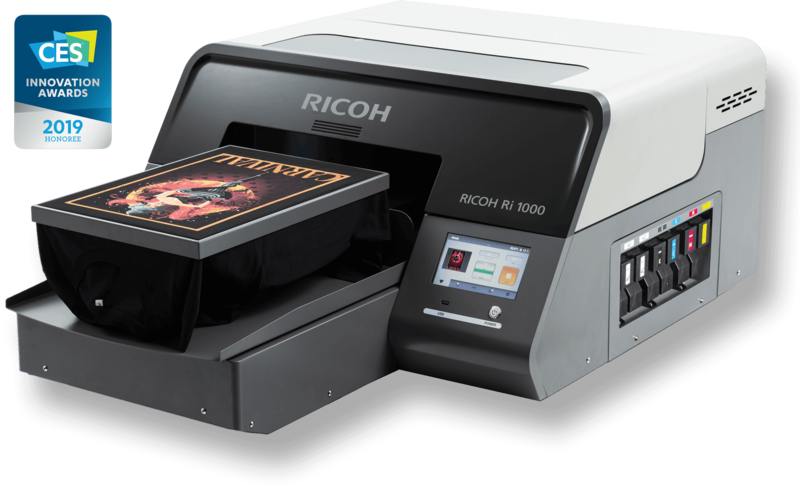 The newest member of the RICOH family of DTG printers, the RICOH Ri 1000 offers advanced functionality at an affordable price. With magnetized quick change platens, largely automated maintenance, and a built-in Interactive Operation Guide, the RICOH Ri 1000 offers incredible value, versatility, and ease of use. Meet the world's first and only DTG printer that comes in a true desktop form factor. With its highly compact footprint, the Ri 100 can sit on a countertop and travel just about anywhere. Complete with a stackable garment finisher, the Ri 100 is safe and easy to use in home and public retail environments. For the ultimate in industrial DTG printing, the Ri 6000 delivers blazing-fast print speeds, rugged construction, and showroom quality prints. The Ri 6000 is the top choice for power users with higher volume expectations. AnaJet now offers one-on-one comprehensive training which includes ink installation, graphics preparation, printer operation and maintenance at your location with a certified Ricoh trainer. AnaJet-certified technicians based in Southern California provide FREE lifetime telephone and email technical support to AnaJet customers Monday - Friday 7:00am - 5:00pm PST. Get the most out of your printer by watching the latest tips and tricks. Or come back for a refresher course using our vast library of online training videos. Looking for in-person support? Upgrade to our premium on-site technical support and a certified Ricoh technician will arrive to service your printer, usually on the next business day.